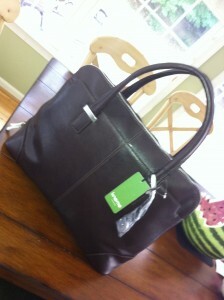 Surely I’m a tad biased in saying this was the most beautiful bag at BlogHer, seeing as this is my bag. But I’m completely obsessed with this bag in ways I can’t even begin to explain unless you are also a woman and a bag coinessour. This bag is the Knomo Rubi Laptop Briefcase ($325). I know it doesn’t come cheap but it’s oh-so-wonderful, delightfully durable and beautiful looking. What my image doesn’t show you is the pretty pink quilted inside, which you can view on the Rubi product page at Knomo.com. Several people stopped me to ask me where I got this bag while I was at the conference too. So there you go. Love it, right? Disclaimer: Knomo sent me a bag to facilitate this review. Drool! Drool! Drool! That bag is so stunning, Whitney. Thanks Shannon – and thanks to you guys for helping me pick the brown! Just love it.